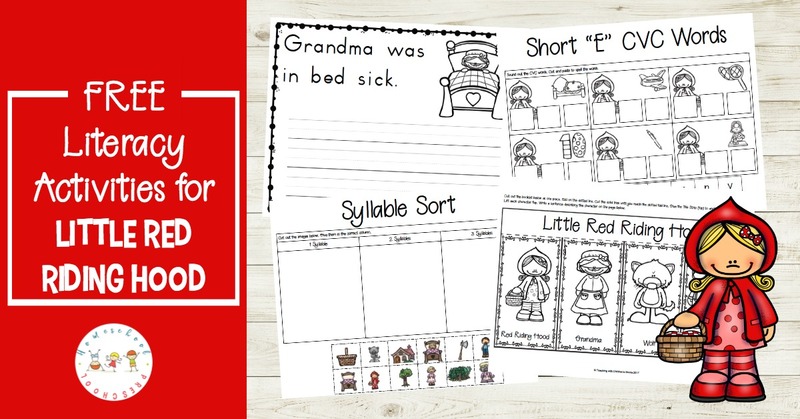 Your students will LOVE working on syllables, CVC words, and more with these Little Red Riding Hood literacy activities. Perfect for your literacy centers. I’ve had so much fun exploring Little Red Riding Hood over the past few weeks. 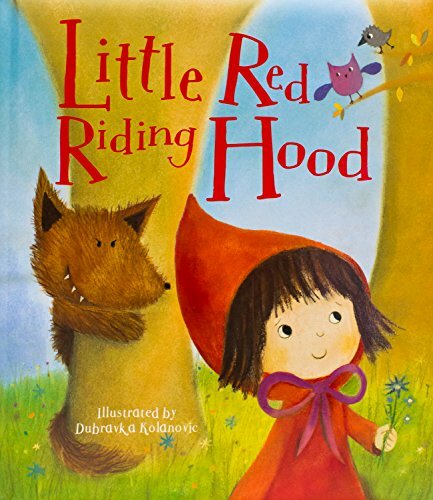 Whether you’re reading a traditional version, a version from another country, or a fractured fairy tale, you’re going to love these literacy center ideas that will help you extend the your Red Riding Hood lessons. 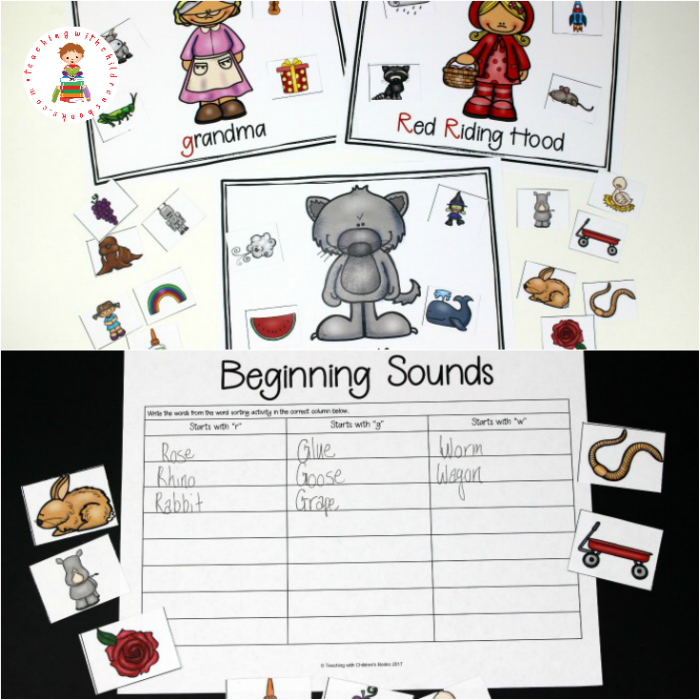 After reading your favorite version of Little Red Riding Hood, introduce your students to the activities included in this Red Riding Hood printable. In this pack, your learners will find activities that will help them practice syllables, CVC words, short “e” words, and more. There are so many different Riding Hood to choose from. Here are just a few to get you started. You should be able to find them at your local library. If not, you can purchase them on Amazon by clicking the images below. 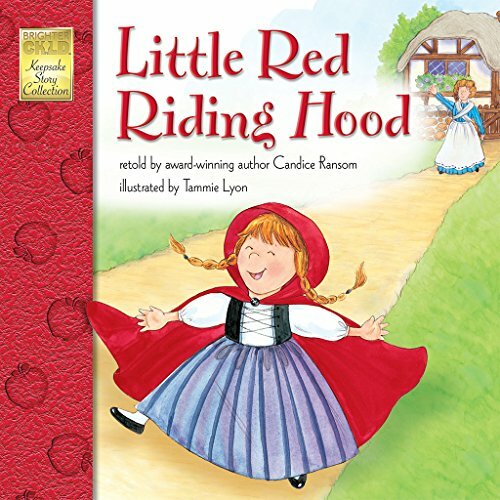 For an even larger collection, check out these 21 delightful Red Riding Hood stories. 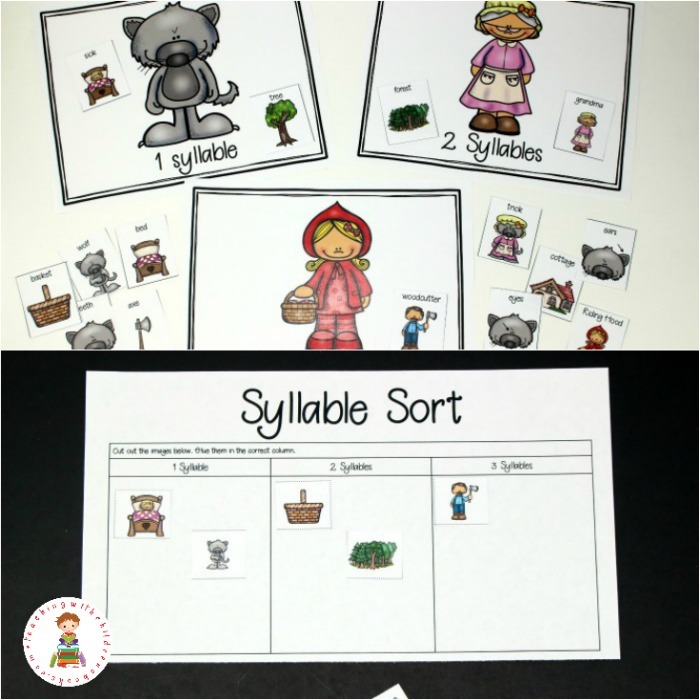 Print out the three sorting mats, picture cards, and recording page. I prefer to print my activities on cardstock for durability, but I print my recording pages on regular printer paper. For this activity, lay out the three sorting mats. Cut apart the picture cards. Have students place each card on the correct mat according to its beginning sound. Once all of the picture cards have been sorted (and checked for accuracy), have students write the words from the sorting activity in the correct column. Print the character flap page on regular printer paper. Have students color each image, if desired. Follow the directions at the top of the page to create a Character Flaps booklet. Have students lift each flap and write a sentence about the character on the page underneath. This activity helps students learn to pay attention to story details. They can write what the character looked like, what their problem was, how they solved a problem, etc. Copywork is an important addition to your literacy centers. Copywork provides handwriting practice to beginning writers. It also introduces young writers to proper sentence structure, capitalization, and punctuation. This pack includes three copywork pages. Each page has a picture to color as well as a sentence to copy. 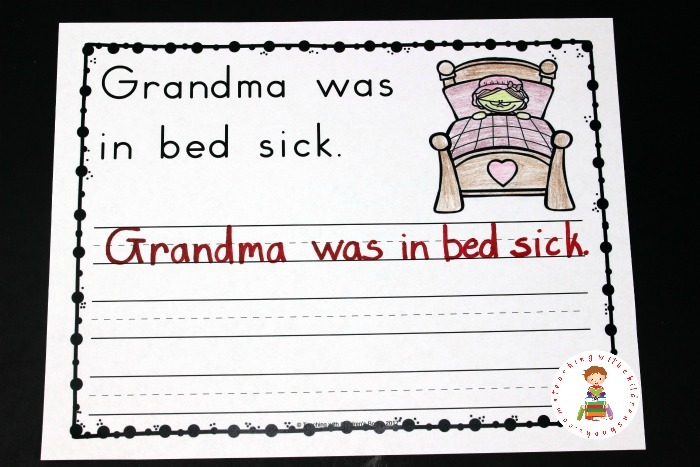 Older students may wish to write these sentences in cursive. That’s okay. 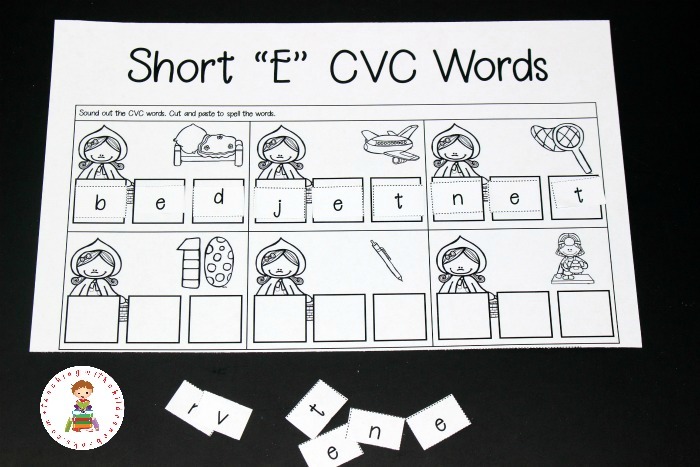 If you are working on CVC words, this activity is perfect! Students will practice building short “e” CVC words. This simple cut and paste activity works on letter sounds, spelling, and fine motor skills. 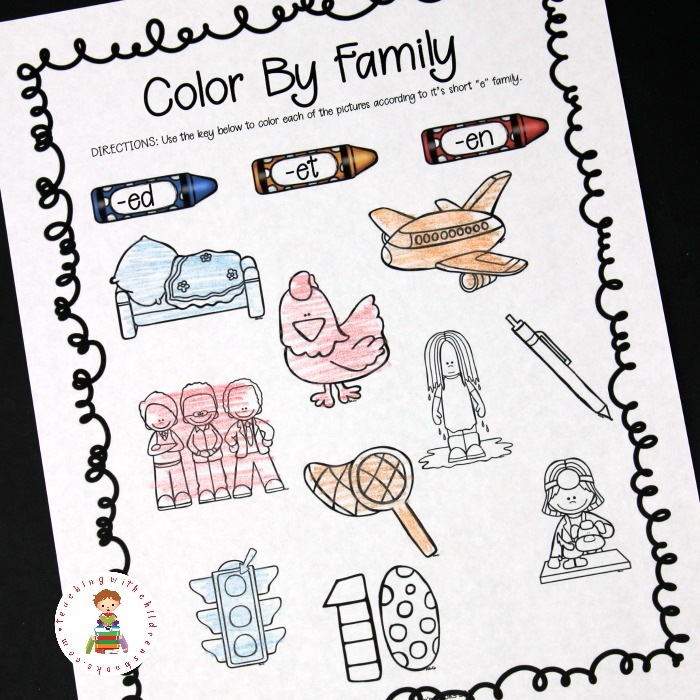 This activity helps kids focus on short “e” word families. They’ll use the color code to color the images on the page according to which family it belongs to. This pages focuses on -ed, -et, and -en words. 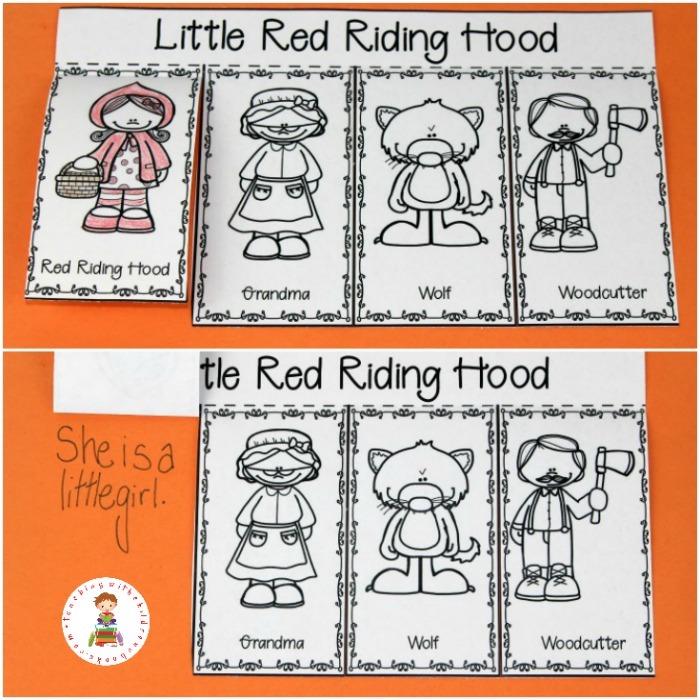 The final activity in this Little Red Riding Hood Literacy Pack has students working with syllables. As with the beginning sounds activity featured above, print the sorting mats and picture cards on cardstock. Print the recording page on regular printer paper. Cut apart the picture cards. Have students say each word aloud and place it on the correct sorting mat according to the number of syllables in the word. Once the cards have been sorted and checked for accuracy, have students complete the cut/paste syllable sorting activity. 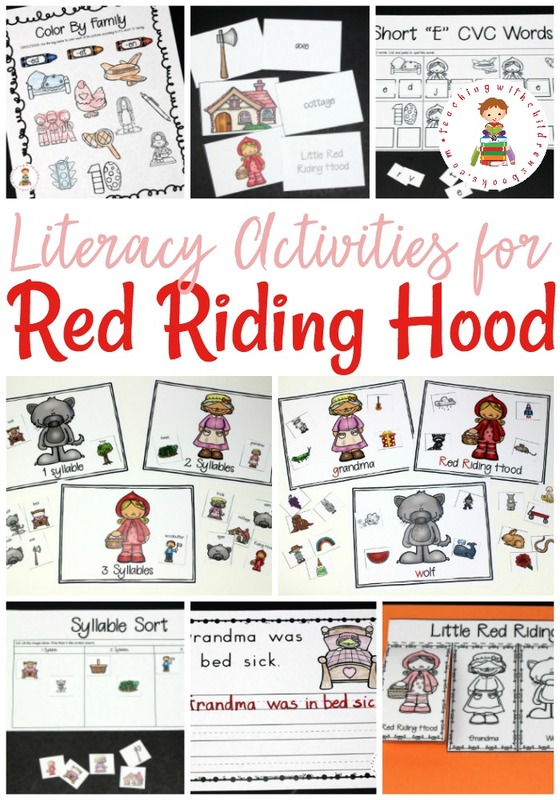 I love this free printable featuring Little Red Riding Hood literacy activities. Your young learners will enjoy all the fun learning pages you’ll find inside.